Frosting holds together a towering stack of chocolate sandwich cookies forming a rocket shape that’s ready for kids to decorate. Stack cookies for the body of the rocket, spreading frosting between every 2 cookies to secure. 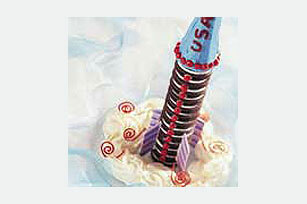 Decorate sugar cone with remaining ingredients as desired, securing candies with remaining frosting; place at top of the cookie stack for the top of the rocket. This is a great project for the entire family. Provide a selection of ingredients, decorating gels and candies so everyone can decorate his or her own. Prepare as directed, using ready-to-spread chocolate frosting.